Specializing in all life's significant events: Thank you for your interest in Essence Entertainment. We are a full service entertainment company specializing in any of life's significant events. The combination of our experience, professionalism and embracing the vision of your perfect event is what sets us apart from other companies. It truly will be your day, done your way. 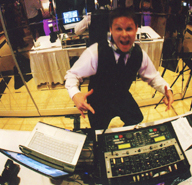 We use our detailed planning sessions with you, our event consultants, DJs, and MCs to create an extraordinary event your family, friends and guests will be talking about for years to come. We can provide you limitless creative ideas to make your event fun, unique, amazing, and memorable for everyone. Not only do we offer professional, experienced DJs and MCs but we offer vibrant event lighting to compliment and create ambiance and additional elegance at your event. We also offer video montage production and presentation. We are genuinely honored and excited about being part of your special day. We provide the highest level of personalized service and we make sure to go above and beyond to exceed your expectations. Essence Entertainment provides a wide variety of services and options, and we're happy to help build the right experience for you, to help make your special day memorable. Here's a short list of some of our Preferred Vendors & Affiliations.